To plan the best Bar Mitzvah in honor of your son, preparation should start 2 years ahead of time. This is the best time to obtain a date from the synagogue and set a budget. By 18 months in advance, you can contact location venues, set colors and theme, and plan the food. Save the dates can be sent out 6 months in advance with formal invitations sent 3 months out when a guest list is finalized. Following your celebration, mail thank you cards 2 to 4 weeks after the Bar Mitzvah. The following Bar Mitzvah save the date wording examples will help inspire the right words for your own event. [name] would be pleased to have you join them when their daughter [name] is called to the Torah as a Bat Mitzvah on [date]. [names] cordially invite you to the Bar Mitzvah of our son [name] on [date]. [names] invite you to share a proud and special moment as we celebrate and joy the Bat Mitzvah of our daughter [name] on [date]. Every generation is bound to the next by a wonderful legacy of family, love, and tradition. We invite you to join us as our daughter [name] is called to the Torah as a Bat Mitzvah on [date]. It would be our pleasure to have you with us when we celebrate a special occasion at the Bar Mitzvah of our son [name] on [date]. It would give us great pleasure to have you join us in worship when our daughter [name] will be called to the Torah on [date]. Memories are created by sharing special moments with loving family and friends. Please join us as our son [name] is called to the Torah as a Bar Mitzvah on [date]. Please join us in honor of our son [name] as he is called to the Torah to become a Bar Mitzvah. The pleasure of your company is requested at the Bar Mitzvah of [name] on [date]. Traditions of the past to share with the future we celebrate today. Please join us as [name] celebrates his Bar Mitzvah on [date]. We cordially invite you to take part in a very special day in our lives when our son [name] is called to the Torah [date]. We hope you can join us as [name] will be called to the Torah as a Bar Mitzvah on [date]. We invite you to share a special day in our lives when our son [name] will celebrate his Bar Mitzvah on [date]. We invite you to share a special time of joy and tradition when our son [name] is called to the Torah as a Bar Mitzvah on [date]. We warmly invite you to join us as we celebrate a special moment in our lives the Bat Mitzvah of our daughter [name] on [date]. With gratitude to Hashem we are honored to invite you to join us as our precious son [name] is called to the Torah on [date]. With great pleasure we invite you to share our happiness at the Bar Mitzvah of our son [name] on [date]. With love and pride [names] invite you to share in our happiness as our daughter [name] is called to the Torah as a Bat Mitzvah on [date]. With pride in our heritage and love in our hearts we invite family and friends to join us as we celebrate the Bar Mitzvah of our son [name] in whom we are well pleased on [date]. Your presence will be very special to us at the Bat Mitzvah of our daughter [name] on [date]. Bar Mitzvah trends are starting to reflect the individual personality and style of the individual being celebrated. Many venues are aiming towards offering alternative seating areas and reception lounges for family and guests. Ceilings can be decorated with drop down cloths, hanging flowers, or paper lanterns. 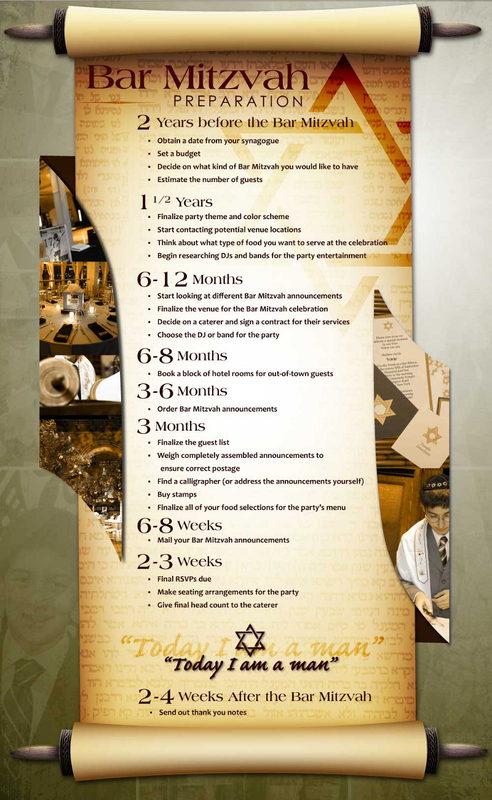 If you plan on being unique in organizing your own Bar Mitzvah, the infographic below outlines the planning stages you can incorporate during making arrangements.